Audio Technica ATH-CKP200 review | What Hi-Fi? The last thing you want while exercising is the weight of headphones dragging you down. It’s a burden Audio Technica is clearly aware of: its low-ranging sport in-ear headphones weigh just 9g – pretty impressive when you think they have hooks around the ears that will add to the weight. Though this 'hanger' design almost always promises a secure, wont-fall-out fit, their downside is often a more cumbersome earphone that’s awkward to mount. Again, Audio Technica has the answer. With the plastic and rubber hangers being so thin and light, it’s easy to forget that they’re there at all – perfect for those endurance-testing training sessions. And with a hinge mechanism connecting them to the ear bud, they can be opened out for easier positioning around your ear. The ATH-CKP200s fit well and never feel like they’re going anywhere; even when we accidentally tugged on the wire, they never became dislodged. Catching the cable won’t happen often, mind – a longer lead running to the right bud than the left is designed so that it trails behind your neck, with the rest falling down your left-hand side. It’s a neat arrangement for keeping wires out of the way, though it does mean your device has to be attached to your left-hand arm or in a left pocket. The choice of a 0.6m or 1.2m cable (courtesy of the extension lead) means that either option can be accommodated. The absence of a mic and remote is slightly disappointing, but the ATH-CKP200s hardly skimp on features. Their IPX5-rating means they can endure a downpour and be washed; we wouldn’t chuck them in the washing machine with your kit, but they can be cleaned under running water. A choice of rigid ear tips, designed not to jam into your ears as much as normal ones so that surrounding noise can seep through, is useful for outdoor exercise, too. 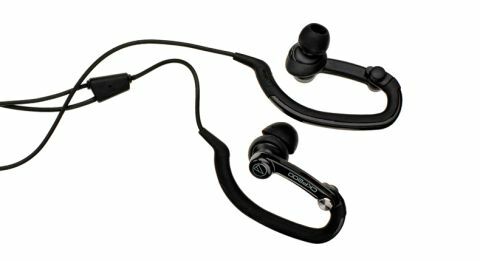 Headphones this cheap are often subject to a thin, tinny sound, so Audio Technica has done well to escape that here. The ATH-CKP200s aren’t the richest of listens and don’t have the bass levels to lap up songs with big beats, but there’s enough solidity and weight behind the presentation to still enjoy bassier tracks. We played everything from Norah Jones to Nirvana and were impressed at the level of detail and clarity they could msuter. Fast and precise, too, they put their best foot forward playing The Knife’s One For You: instrument placement is spot-on, the soft drum beat has a nice tap-along rhythm to it, and the delicate, soft-spoken vocals carry a decent level of transparency. Their clean, articulate presentation is slightly spoiled by a bit of hardness that creeps into the treble; Eminem’s Square Dance has a harsh jingle beat running through it, and the Audio Technicas only surface its severity. These buds aren’t perfect, but for a price cheaper than most pairs of running shoes, we’re more than satisfied with their performance. They might not be the flashiest of designs (though the red-and-blue finish is marginally more eye-catching), but they’re lightweight, ultra-secure headphones that’ll see you through the longest of training regimes. And without you having to break the bank, too.